Capa Center, Project Room, Budapest, 2016. 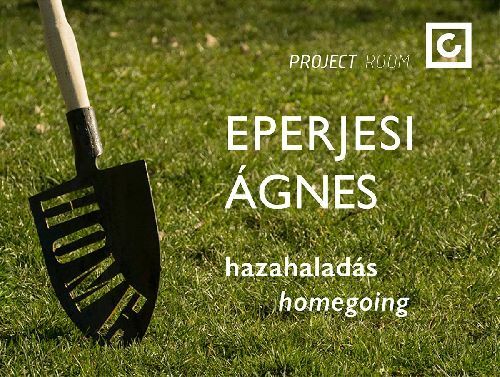 The single exhibition of Ágnes Eperjesi titled Homegoing* is based on the juxtaposition of several works characterized by her critical approach. The central motif of the exhibition is the continuous confrontation with ourselves and the outer world. These artworks created of ordinary objects and everyday observations, built on paradoxes, and oftentimes carrying social and political messages become embodiments of the wrestling between the inner and the outer, the ideal and the moral, the ethical and the righteous. Just as the word HOME inscribed into the head of the spade doesn’t make the tool unusable or functionless, only a little more difficult to handle, the spectator is also placed into ambiguous situations by the presented artworks. The series Step by Step is based on an everyday recognition. As time progresses, the parsley root loses its freshness and causes the stickpin inscription saying “I want to keep a straight line” to get twisted as well, reflecting on the human dilemmas facing all of us at different points in life. The piece titled Practical Issues of Freedom reflects upon political situations just as the object composition called New Evidences. Still, while the Practical Issues of Freedom depicts the time since the change of regime in 1989 historically and in a static way, placing the portraits of the prime ministers into the holiday leave registry form of public-sector employees, the New Evidences is made up of objects, which had been used as parts of performances during social events. The critical approach is also evident in the genre of the photogram, which is often used by Eperjesi.The works leaving the camera behind and utilizing only the light sensitive material are less focused on the outer world and political determination but rather reflect a kind of inner voice and ambivalent feelings. Ágnes Eperjesi’s several artwork groups are integrated into one organic exhibition by the attitude governing the creative process as well as the approach and the way of thinking of the artist. The pieces created via the palpable and displayable forms of movement raise questions like whether it is possible to be progressive without locomotion, the change of location. What does progress mean today (for this era)? Each of the artworks is a kind of statement, which offers several layers of reading and interpretative options via the tension of the inner contradictions and dichotomies. Freedom means the responsibility of decision-making. * One of the mottos of the Reform Age in Hungary in the mid-19th century was: Nation and Progress. The title of the exhibition reflects on this motto, while leaving out the conjuctive word "and" the title also means "going home." Both interpretations are integral parts of the exhibition.